Along International Boulevard on election night, the bright banners hanging from windows of local businesses supporting candidates and propositions were everywhere. Local business owners, community leaders, and entire families were anxiously depending on the results that would impose change in the policies and leaders within their communities and their country. 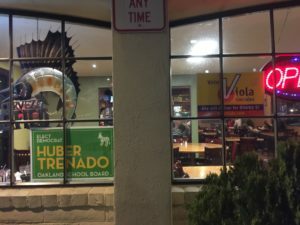 Damu Dailey and Abel Regalado, two Oakland Voices correspondents, were on our way to the Guadalajara Restaurant and the election night celebration for Viola Gonzales. Gonzales, who was running to represent Oakland’s District 5 on the city council, warmly greeted us, as she was having dinner and conversing with some of her closest supporters. Though local elections were at stake, the presidential election was definitely a point of conversation at every table. 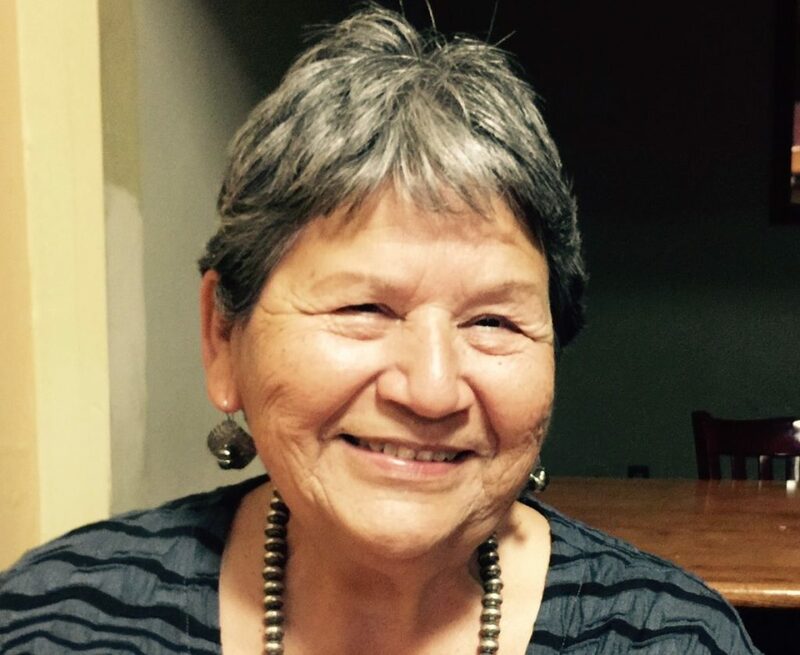 Gonzales talked to us about Oakland and District 5 – the Fruitvale area – in particular. She told us about her decision to run. “If you’re lucky in life, then you have friends,” Gonzales said with a confident smile, “My family and friends said to go for it – and we will stand with you.” And by the looks of the room, they were all still standing with her strong. Her campaign is proud – a community-based effort. Some of her supporters said they have known her for more than 15 years, while she led non- profit organizations and was part of various boards throughout Oakland and the Bay Area. She worked at the Latino Community Foundation and the Unity Council. She held an executive leadership position with AnewAmerica Community Corporation. She has also worked with community leaders such as Mayor Libby Schaaf, former Mayor Elihu Harris and former Oakland City Council president Ignacio De La Fuente. She’s served on the Oakland School Board, City Planning Commission and Oakland Fund for Children and Youth. In addition, she has an MBA from Harvard. Gonzales put us at ease with her welcoming demeanor. And it was nearly impossible to get the sense that we are deep in the last stages of a tight battle – the very last moments of her campaign. After all, we are in her world, the Fruitvale is her home, and we are guests. 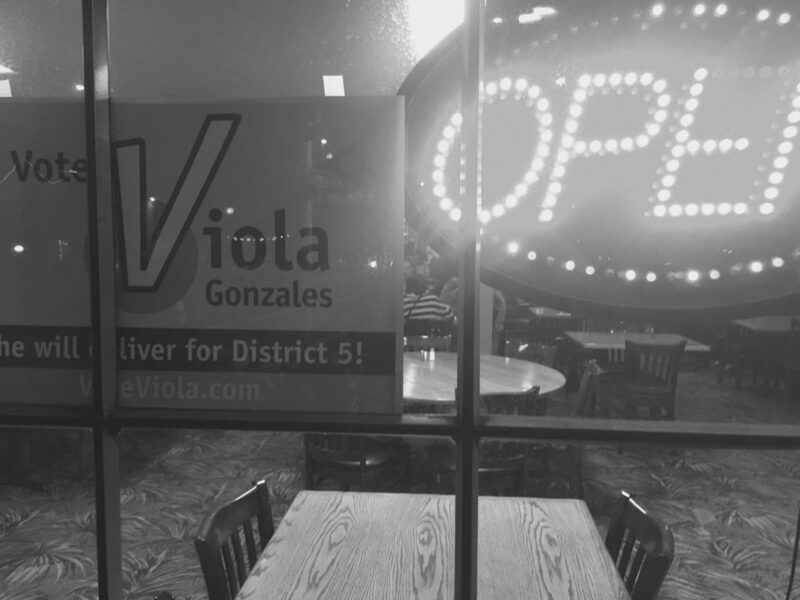 The family vibe of the Guadalajara restaurant represents the grassroots, door- to- door, efforts, of Gonzales’ campaign. She introduced us to several people who enthusiastically came over to hug and smile with Gonzales and to thank her for representing their community with such honor. Even though she got a late start to her campaign, she managed to build support and a volunteer effort. With great confidence, her supporters said Gonzales is the candidate that the Fruitvale needs. “She will tackle the root of the problems affecting us and not just the branches,” said one supporter. “People are really excited that you’re running when you show up to their door! Some invited me inside for water or coffee; they wanted to be engaged,” Gonzales said. It’s important to know a little bit about the road she has traveled to get to this point – a point where she is endorsed by the Mayor of Oakland for a potential seat at the table of Oakland’s government. As a little girl, Gonzales, grew up in Texas. “Texas was a place, during that time, where people understood the value of their vote,” she said. And on a night where a Trump election is looming, the message is powerful. As she talked about the Fruitvale and her beloved Oakland, 75 to 100 supporters were seamlessly flowing in and out of the room, buzzing about all of the evening’s electoral happenings. “In two more minutes, we will get more results,” a staffer interjected. Gonzales continued talking to us about how the city could improve its basic services, as if we were the only people in the room. At 70- years- young, she never missed a beat. At about 8:30 pm, the first vote counts came in with a 57 percent in favor of the incumbent, Noel Gallo. 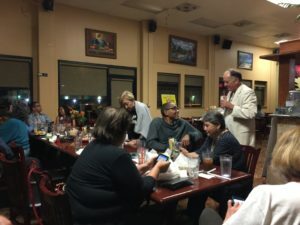 Gonzales and her supporters knew that he was a strong contender, and that would have an impact on the people voting for her. Still, the faces in the room reflected hope. “The people who worked for me showed they believed in my movement by giving their time, making calls and asking for donations when needed,” she said. It was this hope that kept supporters going for months and helped Gonzales get to this point in a campaign. Her supporters knew that win or lose, they would take home the spirit of enthusiasm, something that their candidate strongly believed in which would get people to work together in movements or for things they believed in. And for us, community correspondents, meeting Gonzales and visiting her campaign, reinforced our belief in the people of Oakland. Thank you for the thoughful introduction to someone not in my district, but who seems like my kind of Oaklander. I hope that she continues to be involved in our city.